New to Lync is the handling of “analog extensions”: faxes, courtesy phones, modems, etc. Prior to Lync, analog devices were typically created and managed through your voice gateways, perhaps with manual routing entries and no control over barring or means of cost recovery. It was far from elegant. Now you can create the extensions themselves as Contacts in your AD, add a picture, dial them by name, apply Lync voice policies, and even collect CDR when they’re used – so they’re very much now an integral part of the Lync solution. Note we’re using TCP for this basic gateway, and Port 5068. New-CsAnalogDevice -LineUri tel:+61212345678 -DisplayName "Name Goes Here" -RegistrarPool lync2010.contoso.com -AnalogFax $True -Gateway <Quintum’s IP/FQDN> -OU "ou=RTC Special Accounts,dc=contoso,dc=com"
BTW, because Lync doesn’t handle the T.38 fax protocol, you need to manually set “AnalogFax” to $true for all ports with a fax or modem on them. This forces all calls to/from that device to G.711. Make sure the Primary SIP Server Port is set to 5068, or whatever alternate port you might have chosen in Step 1. Also note that the Register Expiry Time is set to “-1” – it doesn’t register with the Front-End server. If you skip this step or specify the wrong port, you won’t be able to make calls to this extension/gateway. The var_config file can’t be accessed though Telnet – you get to it through the Tenor’s Config Manager / Tools / var_config. “SipTransportDefault” forces the Gateway to TCP (where a 0 would make it UDP), whilst “SipPrependPlus” automatically handles the “+” we deliberately omitted in Step 7. My Dialogic gateway (my FXO interface to the outside world) didn’t want to accept outgoing PSTN calls that were coming from the Quintum. The Inbound VoIP Rules in the Routing Table were looking to match on the server’s FQDN and not the SIP domain, so were rejecting the call. 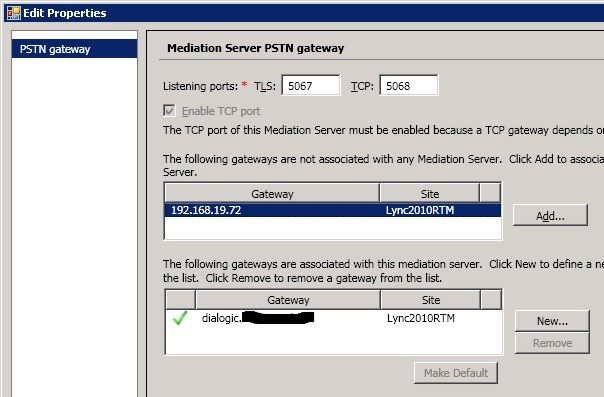 A 403 was returned to the caller and the Dialogic call logs reported “VoIP: Not Accepted”, which was also reflected in the Lync Logger traces. The solution was to change the Originating VoIP Host Address in the Dialogic’s Config / Routing Table / Inbound VoIP Rules from an IP/FQDN to “*”. if you follow the document. I’m hoping you can point me in the right direction. 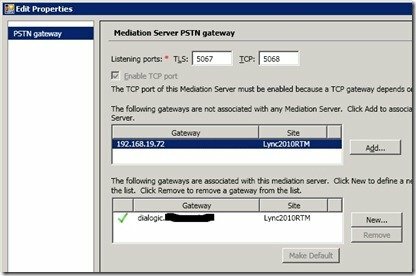 We had a Lync 2010 setup with analog extensions setup and working. We’ve upgraded to Skype for Business and in the process, our analog ext aren’t receiving external calls. They can dial out and receive internal calls though. We use an SBC1K as our gateway. Thanks so much Greig, it does seem to be exactly our problem.